Hubby and I glance up at each other and together our minds go back to that wonderful time. Our day at the spit was spent beach combing and of course building forts from the plethora of smooth driftwood. Camping is a popular option here and the sites down by the water are spacious and beautiful but they are strictly for tents. If you do bring your trailer or RV you have options to stay in the sites above which are also nice as they are large and private. In the evening we made reservations to dine at The Bay Cafe in the village on Lopez. I was completely looking forward to dining at the Bay as new owners Tim and Kristin Shea have brought their well known culinary talents to the island. Before signing on as the new owner of The Bay, Tim spent the last 11 years as a server, manager and maître d’ at Bis on Main in downtown Bellevue in Washington state under the direction of owner and mentor, Joe Vilardi. I could hardly wait! Tim and Kristin welcomed us with open arms and big smiles. We immediately felt at ease and dining with the sweeping view of the bay outside, well, it brought everything beautiful about our day together, full circle. Our dinner was amazing from the steamed clams to the simple rocket salad that to this day I have made countless times (arugula [aka rocket] a little olive oil, lemon, crushed Marcona almonds with grated Parmesan-Regianno and that’s it! Thank you Kristin!!). Using local ingredients is something Tim and Kristin take pride in and it’s no wonder since Lopez is an agricultural mecca for organic farmers. As we said goodbye and stepped outside we looked up at the sky. “It’s going to be an amazing sunset tonight,” hubby noted. Ahhh, Odlin County Park. We absolutely ♥ it here. Last year this is the spot where we camped with our Airstream and spent our Thanksgiving together. Just the three of us and when I say just the three of us, I mean it. We had the complete park to ourselves. When we departed last year from Orcas to head over to Odlin on Lopez the weather was quite stormy. We were also the only ones in the ferry line that Thanksgiving morning . . . I baked a turkey in the Airstream oven and as an appetizer I bought a nice big block of cheese. Along with some great wine for us and warm cocoa for B it was the most beautiful Thanksgiving we have ever had. Ever. I believe that it was the simplicity of that evening that remains in our hearts forever. 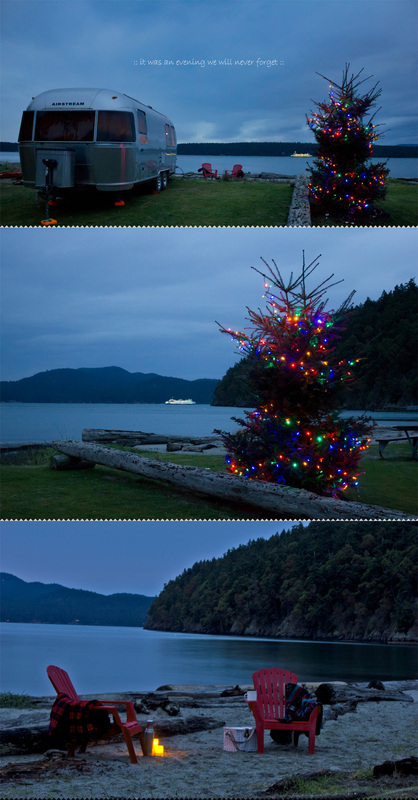 As we move on to our winter Airstreaming skiing adventures here on Just 5 More Minutes, I would like to take a moment to thank everyone of the San Juan Islands for welcoming us with such open arms and most of all, your kind warm hearts. It is with great sadness that we are no longer there and I can only hope that in the future we will be able to make a return visit. This is so beautiful! I’ve never had the pleasure of traveling to this area of the world, but now I know what I am missing! Now I just need an Airstream! Thank you Jeff :) Yes, I agree, an Airstream would be an excellent choice for touring the islands but you will also have other options for accommodations too! If on Orcas Island check out The Outlook Inn or Turtleback Farm Inn, for San Juan Island you can’t go wrong with Tucker or Harrison House and lastly on Lopez if you do bring an Airstream (or not) the Islander is the way to go! We went for the first time this August, such a beautiful place! This post just brought me to tears!! You have taken me on a whirlwind trip through those beautiful San Juan Islands and now it has come to an end. Oh well I suppose I can always go back and re-read all of your beautiful stories. How lucky “B” is to have such a wonderful mamma who opens his world up to so many things. I will look forward to your next adventure that is for certain!!! Your photography of the islands reminds me so much of the book Anne of Green Gables. Such beauty is there in those San Juan Islands. Such beauty! Sylvie, I will have to check that book out! Thank you for the recommendation! Oh how I love that island! We visited it in fall 2010. The scenery, the food and the people. Truly unique!